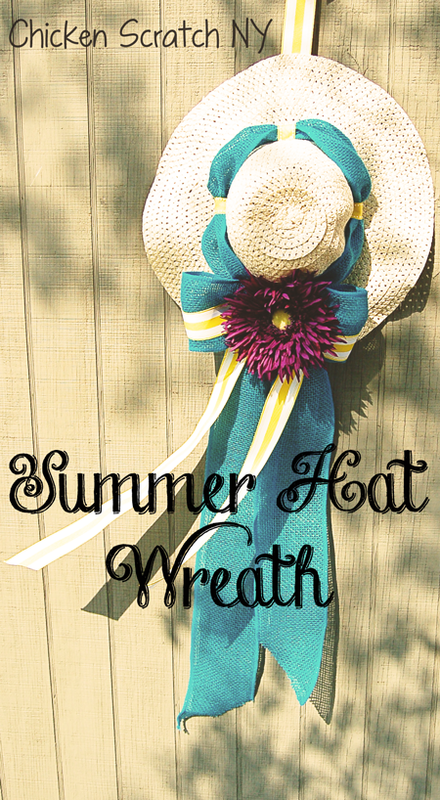 I was revisiting some old content of mine when I cam across my Summer Sun Hat Wreath. I had forgotten about it and how cheerful it was. After a quick trip back to Dollar Tree I found myself in possession of another sun hat. I turned the hat and a few bunches of fake tulips into a Spring Wreath. This time I had my hot glue gun handy and the wreath came together quickly. 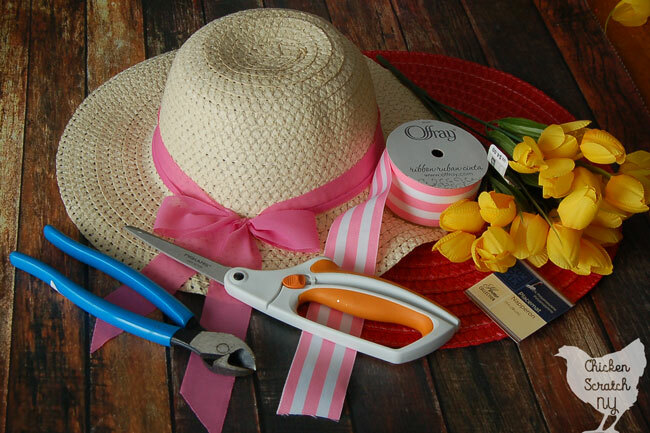 I learned from my last hat wreath that you need to support the hat to help it keep it’s shape. The hat I found this time was smaller than the original but I found a brightly colored place mat that was about a half inch larger all the way around. 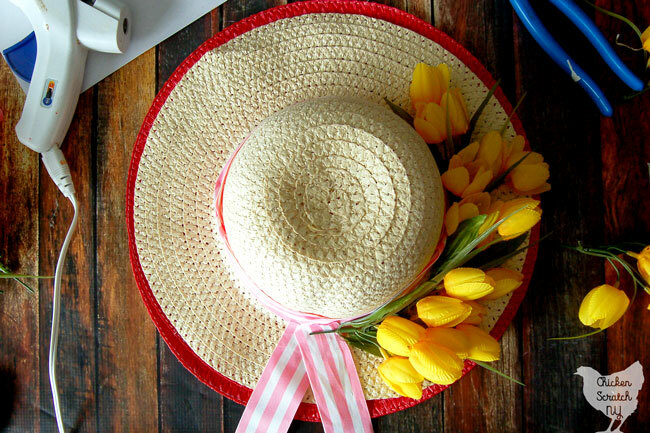 The place mat would pull double duty, it would support the hat and help it keep it’s shape and add some size to the hat. It’s also how I ended up hanging the wreath. 1. 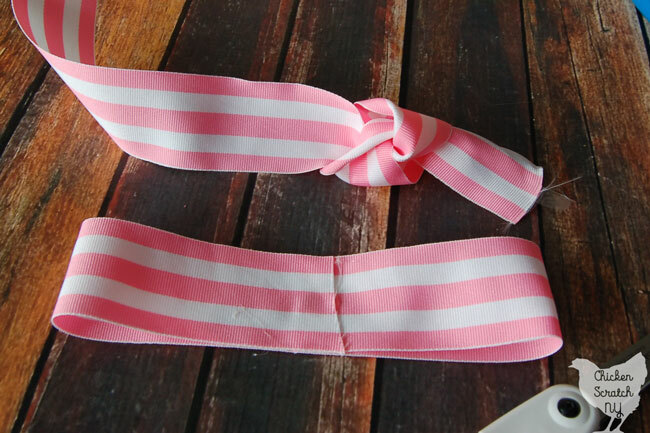 Pull off the original hat ribbon and throw away or let your 2 year old wear as a belt. Generously glue the hat to the place mat. 2. 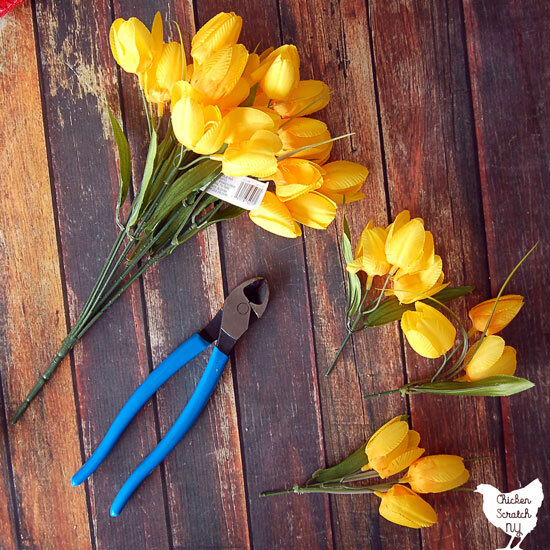 Use the wire cutters to separate the bunches of tulips into small groups. Push all the leaves up to the top and trim the stems short. 8. 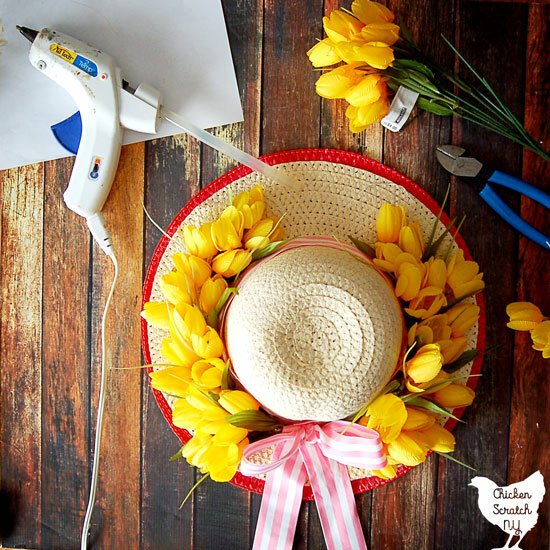 Glue the tulips around the hat, overlapping the pieces so the flowers cover the ends. Leave a few inches at the top empty then start at the top and work your way down. Great tutorial, I need a new wreath for my door and this gets me motivated! That is so precious! I haven’t been very good about decorating for holidays this past year, but I could totally handle bringing seasonal items in. The tulips make it feel like spring! Thank you! We just had another half foot of snow dumped on us, I’m so ready for spring! Hello Spring!! This is such a cute idea for a wreath. 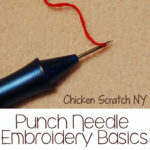 Definite looks easy to make too! 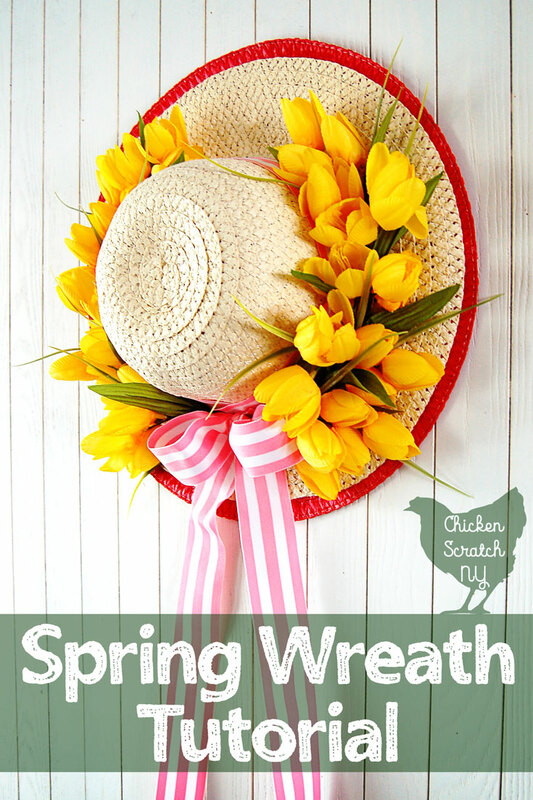 Love the idea of using a hat as the base for the wreath this is so creative and looks beautiful. 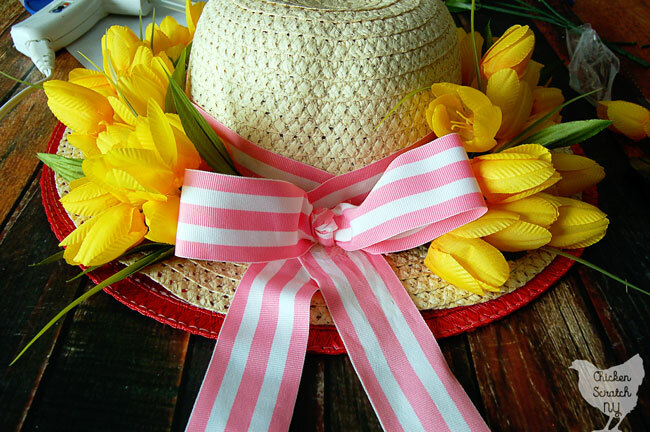 Perfect for Easter and springtime. This is perfect! I was just thinking I had nothing for our doors after Easter. Plus- it’s easy and affordable! This is so cute! I really love the idea of using a hat. Very unique and creative. That is too cute. I like that you used a hat to bring it to life. 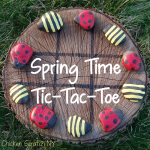 Such a great idea to bring spring into your home. 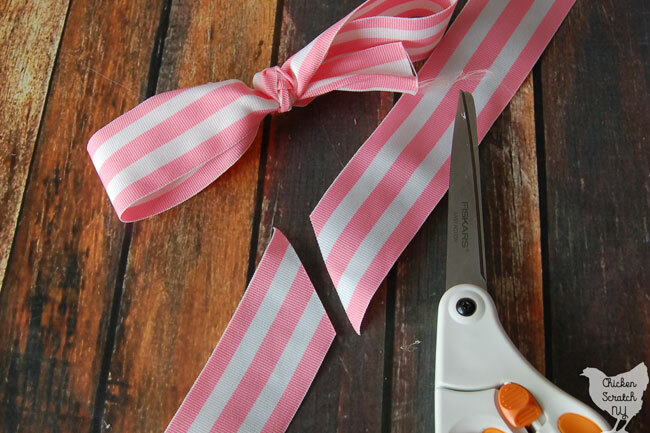 I love this wreath idea I am also looking for something easy to ake for y door as well that doesn’t cost too much to ake and looks cute as well. What a fun play on a wreath. I love this idea. So springy!